Caution: Children under the age of 4 and the elderly should be under supervision when eating this product. Keep away from direct sunlight and store in a dry cool place. Consume soon after opening. 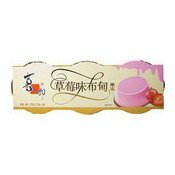 Simply enter your details below and we will send you an e-mail when “Jelly Cups (Strawberry) (草莓布丁)” is back in stock!